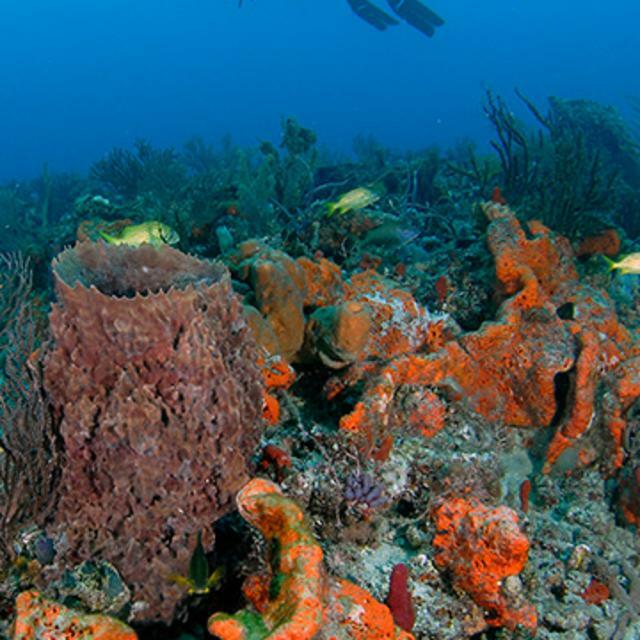 Just as Broward County&apos;s beaches attract tourists, the ocean environment draws diving and fishing enthusiasts from all over the world and Broward is home to part of the only coral reef in the continental United States. The reefs extend the entire length of the County and are separated into three distinct north-south tracts (inner, middle, and outer). These reef tracts range in depth from 15 feet on the inner reef tract to 90 feet on the outer tract. There are 25 permanent research sites located offshore of Broward&apos;s 23 miles of coastline and these sites have been monitored periodically since the 1980s, and continuously since 1997. At each monitoring site, the numbers and types of corals and sponges are recorded to compare differences in between sites and over time. Numerous one square-meter areas of reef are photographed and studied to monitor changes in the reef environment, and fish counts are carried out to determine the number and types of fishes found at each of the study sites. In addition, sediment collections are sampled at each of the sites to determine the amount and grain size sediments that settle onto the reef. The results of this biological monitoring not only provide a time series record of Broward County&apos;s reef system, but also assist in the identification of factors which may damage organisms or reduce the populations of corals and sponges on the reef. Since 1982, the Broward County has created over 112 artificial reefs off our shores. The reefs, which are designed to create a new stable substrate, are made from a variety of materials including ships, barges, oil rigs, limestone rock, concrete culverts, engineered concrete artificial reef modules, and other environmentally suitable artificial reef materials. These materials are placed at various depths where they quickly become habitat for a large number of marine organisms. Through the artificial reef program, we are not only creating additional habitat for various marine organisms and fish, but are also protecting the reefs as boat anchors and scuba divers can cause physical damage to natural reefs by breaking coral or "uprooting" other attached marine animals. This will benefit both our environment and our economy for years to come. Tax-deductible donations of material, services, and transportation costs have been the keys to the success of the Artificial Reef Program and donations are always welcome. Learn how much weight is ideal to get you to the bottom. Practice your buoyancy skills before diving on coral reefs. Swim at an attitude parallel to the reef to avoid kicking it with your fins. Shallow artificial reefs are good places to practice. You will enjoy a longer, safer dive if you hover a bit above the reef. The air in your SCUBA tank will actually last longer. Clip the alternate second stage regulator (octopus) to your Buoyancy Control Device (BCD) so that it does not drag across the reef. This goes for lobster hunting gear as well. When diving for lobsters, wear gloves to protect your hands, and if you must touch the reef, please do not touch corals. Spearfishermen—if you need to sit on the bottom to reload or float a fish to the surface, find a sandy spot to settle on. It is imperative that you clean your gear when moving to different areas along the reef. Microbial organisms can hitch a ride on unwashed dive gear, spreading disease from dive to dive. It is important to disinfect wetsuits, masks, fins and SCUBA equipment. While on board your vessel, clean gear with non-ionic detergents and soaps. Use a diluted bleach wash once you return to shore. Opt for biodegradable, reef-friendly sun protection. Sunscreens containing between 1-10 percent Oxybenzone may harm corals. If you can’t avoid Oxybenzone, opt for the lowest concentration. Any small effort to reduce Oxybenzone pollution could mean that a coral reef survives a long, hot summer, or that a degraded area recovers. Please do continue to wear sunscreen to prevent the risk of skin cancer, as the sun in South Florida is very strong. To protect the coral reef ecosystem, it is important to learn and abide by the science-based fishing regulations established by the Florida Fish & Wildlife Conservation Commission (FWC) and the South Atlantic Fishery Management Council (SAFMC). Please do not take more than you are allowed. Better yet, take only what you need. Fish are not just products of the coral reef ecosystem; they are also part of its fragile ecology. Like productive citizens, they provide goods and services to the ecosystem to which they belong. Do not drop an anchor on the reef. Anchor in sand up current of the reef and pay out line until the boat is over the reef. Use circle hooks. Fish rarely swallow circle hooks, and they are easier to remove, so more undersized and unwanted fish you release will survive. Discard fishing line in proper recycling receptacles. When bottom fishing, use braided line and a leader lighter than the breaking strength of the braid. If you get hung up, you’ll leave a minimal amount of line on the reef. Seagrass meadows in estuaries support coral reefs by filtering water, stabilizing sediments, and providing nursery habitats for fish species that live on reefs once they mature. Propeller scars cause seagrass meadows to erode. Plan your route ahead of time, consult nautical charts frequently, and know your vessels draft to avoid running aground on seagrass or reef. There are major penalties for harming either. Boats can be disease vectors and transplant exotic species. Wash your boat thoroughly, including the bilge, before traveling from one area to the next. Fuel up and add oil in a calm area to avoid spills. Be careful not to overflow your fuel tanks or oil receptacle. Dispose of trash on shore and recycle! Make sure to avoid sunning sea turtles or manatees. Marine debris is anything man-made and discarded that enters the marine environment. Most trash comes from land-based sources. Trash on the ground may be swept into inland waterways by rain and wind, where it will then make its way into the ocean through rivers and streams. Trash left on beaches is also a culprit. Participate in marine/ beach/reef cleanup events and activities. Recycle! Dispose of trash and recyclable materials in the proper receptacles or bring trash and recyclables home. Reduce marine debris from fishing gear. Bring lost fish traps and tangles of fishing line to recycling bins. Respect marine animals and their environment; leave coral and living shells where you found them. Re-use works! Keep reusable bags handy, carry a metal straw, use a refillable water bottle, consider reusable containers instead of disposable baggies. When creating an artificial reef, it is important to understand how the materials will act over time in the ocean. Ships, concrete, and limestone boulders are materials that have been used locally and worldwide and have been very successful in creating reefs while tires are an example of material that may not be suitable for use as an artificial reef. Broward County is working with State and Federal agencies to remove a failed artificial reef constructed wholly of tires. Never dive alone; always have a dive buddy with you. At a minimum, you should be Wreck Diver SCUBACertified. This certification is available through most dive facilities in Broward County. Always assess the weather conditions before leaving the dock and again at the wreck site. Once on the site, you and your dive buddy can determine if the wave height, current, and/or visibility will allow for a safe dive. When diving on an artificial reef, you should always leave someone on board the boat that can operate the boat in an emergency. This person should maintain a watch for divers surfacing downstream of the artificial reef. Be aware of the hazards of fishing line and other debris that may snag a diver while on an artificial reef. Each diver should carry a knife and/or wire cutters to avoid entanglement. It is not recommended that you go inside any wreck. The most colorful and beautiful corals, sponges, and fish are on the outside of the wreck. Pre-plan your dive and stay with that plan to avoid trouble. Finally, only dive within your capability. Many different types of fish can be caught over or near artificial reefs. Reefs deeper than 200 feet are especially productive for large open-water predators. Amberjack, strong fighting fish that can weigh over 100 pounds, are one of the most common reef residents.These fish school over the artificial reefs from January to July, with May being the peak month. Other species of wreck dwellers are black, gag, warsaw, and snowy groupers. Giant goliath grouper also make many of the wrecks their home. Additionally, many species, including sailfish, kingfish, Spanish mackerel, barracuda, mutton snapper, and cobia appear to use the artificial reefs as feeding areas and can be caught in abundance many hundreds of yards from the artificial reef. Anglers should be aware that many fish are protected by state law. For current regulations, visit the Florida Fish and Wildlife Conservation Commission.